We often say that celebrities wear some of the best high heels out there. Now you can own them, inlcuding ones worn by Taylor Swift, thanks to an online auction. It is the time for the annual Kick Up Your Heels auction. It is an online charity auction, that takes place on eBay. Lots of celebrities take part in it by donating a pair of their designer high heels. The proceeds of the auction will go towards Chiari Malformation Research which is a brain disorder. Chiari Malformation is a serious neurological disorder where the bottom part of the brain, the cerebellum, descends out of the skull and crowds the spinal cord, putting pressure on both the brain and spine and causing many symptoms. The auction will continue through the month of February and maybe even a little bit beyond that. Dozens and dozens of celebrities will take part. Between them are Taylor Swift, Bonnie Tyler, Kristianna Loken, Maria Sharapova, Ana Ivanovic, Gillian Anderson and many, many more. 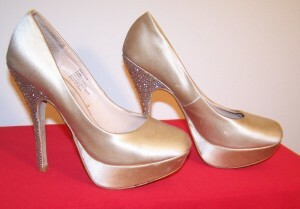 The auction will have only a certain amount of high heels offered at a time. When one auction is done, another one will be uploaded so it is best to keep checking the auction site from time to time if you want to get high heels owned by a specific star. All of the auctioned shoes are autographed by their owner. This makes them more of a collector’s item than ones you will be wearing. But no one will stop you from wearing them if they fit you. The Kick Up Your Heels auction is already underway. The initial bids for some shoes are about 100 dollars, but there are also much pricier auctions. One of the most expensive ones is Taylor Swift’s high heels which have an initial bid of 1989 dollars.